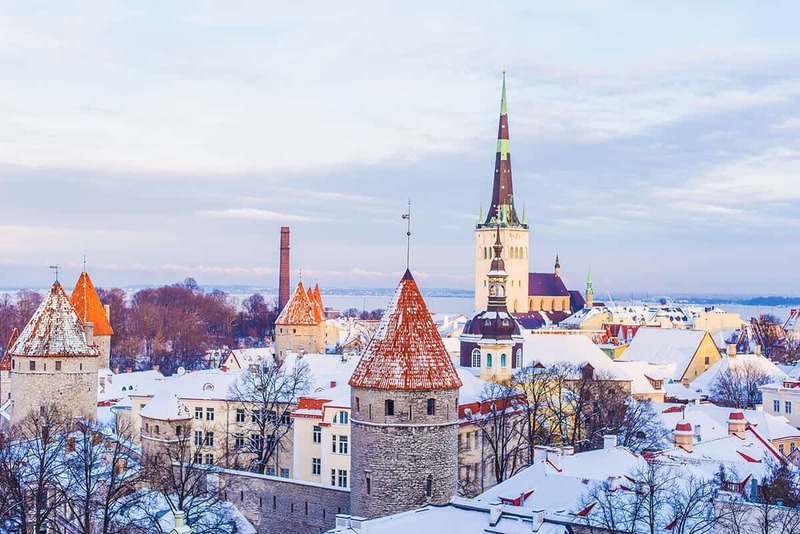 Whenever we are on the road, we’re always interested in learning about new places through their traditional dishes and getting to know the locals by eating where they eat. While planning our itinerary for our two days in Prague, we decided to prepare a list of the typical Czech food, but we soon realized that what we found online was a bit confusing. Everyone was gushing about Trdlo, while the locals were all about Kolache. Trying to find out what to expect wasn’t easy, so we asked for some local help and decided to write a guide about the best Czech food in Prague, to make sure you avoid the tourist traps. Eating like a local will in fact help you to find cheap places to eat in Prague… and drink a pint for no more than a couple of Euros! To understand more about the good cheap places to eat in Prague we have been invited by Eating Prague tours to attend one of their food tours. At first we were skeptical. The tour lasts a few hours and while we had meticulously planned even the best area to stay in Prague because we only had a long weekend, spending half a day just eating felt like a huge waste of time. Sure, good food is still good food but there’s so much to see in Prague that we were worried we’d miss out. Yet we were visiting Prague in Winter, so trying out new, rich dishes from the local cuisine didn’t sound to bad. Also we soon came to realize, reading a few of the reviews online, that a good food tour (one that won’t be a waste of time) won’t only show you the best foods to eat in Prague, but it will tell you about history and the local traditions. Our appointment with the tour guide was at… a gingerbread shop (see below). While we often experienced our self guided food tour in Naples, we weren’t sure what to expect when we opened the door to this little shop that felt a lot like Christmas Alley in Naples. Sitting at a round table there was Robert, our guide. An American who moved to Prague to live with his wife, a Praguer. With time he started to feel at home in Prague, so much so that he decided to show people from abroad the “real” Praha, not the diluted, over-touristy version of the city that many get when they decide to live off the street food in Old Town Prague. While sitting down with a bunch of strangers, with a nice gingerbread cookie each, we all felt a bit uneasy. All it took Robert was a constatation: the Praguers looked at us like we were having some secret book club meeting. And that was it. If you add the fact that he has friends in Naples, that he loves our city and was reading my post about the Art Metro stations in Naples for his next trip to Napoli, you’ll guess why it was love at first sight. Throughout the tour we got to discuss of the differences between Naples and Prague, and it was an interesting way also to learn more about a city we still didn’t know well. Another bonus point to a Praga food tour, for us, was that we got to meet people from all over the world. Our group was made by people from Italy, Australia, London and the USA. The size was also perfect, it was just six people, ideal to be able to chat, make new friends or just ask questions. So yes, a food tour can be a great chance to socialize also if you are travelling solo. The Eating Prague Food is a walking tour: don’t feel worried about having to walk too much, because it will be done at your own pace. We got to do some nice sightseeing in Prague with Robert, who told us a lot of stories, and important historical events about the Czech capital, so we managed to fit this tour perfectly in our schedule, because we explored the parts of the city we still hadn’t been to. Now, while Robert told us that someone in the past complained that the food wasn’t enough, let us just be very honest. We got to eat seven courses at different Old Prague restaurants, shops and secret gardens. By the end we were so full that we decided to skip dinner. To be able to eat everything, have a light breakfast before to attend! And in case you are still hungry or want seconds, all you have to do is ask. Wondering where and what we ate? Let us show you! The gingerbread man’s dream in Prague: where it’s always Christmas! This quaint little shop where it’s always Christmas is owned by two sisters-in-law, who are reviving Prague’s gingerbread tradition. 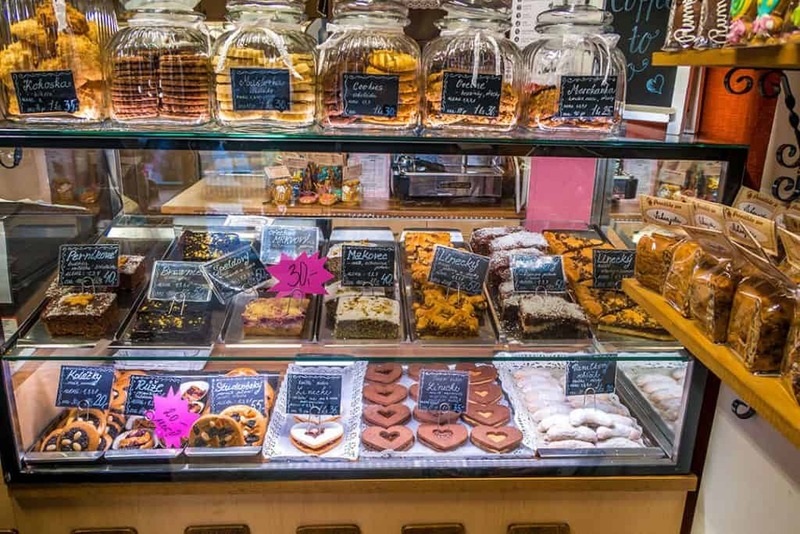 Now, our question was… why the heck did we have to start a food tour with cookies? Well, the fact is that while everyone is eating trdlo thinking they are “traditional Czech desserts“, the Praguers prefer gingerbread. What we learned with this tour in fact is that Praha’s cuisine is split in two. The kind of food they prepare just for the tourists, and the kind of food that the locals really eat. The touristy dishes are of course much more expensive, whereas of course the best local restaurants in Prague can be very cheap. If you want to make sure you recognize a pub for the locals, check the Prague Beer price: if it’s very cheap (we calculated about 2€ with our currency) then go for it! While we were sitting in this shop we only saw locals, and not one tourist! At Pernickuv Sen we tried the traditional gingerbread, which is often used in the Czech Republic as a digestive, then a delicious version with plum jam and walnuts (it was divine!) and poppy seed kolache, a soft pastry filled with poppy seeds. Here are the delicious cookies we ate at the Gingerbread’s man dream! While nowadays the Praguers eat gingerbread cookies throughout the year, they traditionally baked them for Christmas. They still do, actually and they also sell them at the lovely Christmas markets in Prague. It’s a very long process that can take weeks, because they have to be perfectly dry to decorate them. When they are ready, the Czech tradition is to exchange them as presents to relatives, friends and loved ones. Some families bake hundreds of them to make sure they always have some in case of a surprise visit! Of course each family has a slightly different recipe, passed down through the generations, and claims they make the best gingerbread cookies ever! Another curiosity we learned is that poppy seed cookies or gingerbread cookies are generally gifted when a couple hands down wedding invitations. You can’t give someone only the invitation, because it has to go with a small box of cookies: how lovely is that? In this shop you will also find everything you need to bake, as well as nice gingerbread cookies decorated with Praha designs, perfect if you’re looking for a different souvenir to bring home! Another very typical Czech food in Prague is Chlebíčky. The open sandwich is served as an appetizer or as a snack. 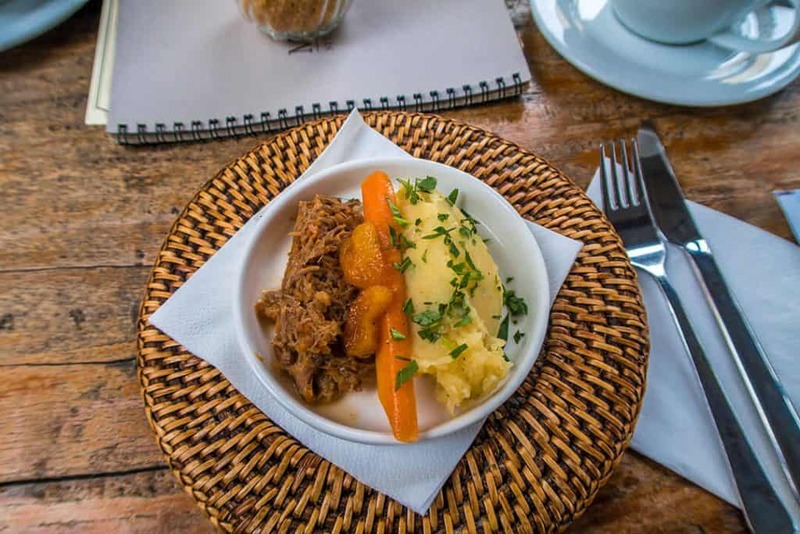 You will find chlebíčky at every party, and here at Sisters, thanks to the famous chef Hana Michopulu, chlebíčky becomes more modern and healthy. The sandwiches are to be eaten in small morsels, and become a fancy finger food, resembling some French delicacies. The spreads are made out of vegetables, eggs or meat, and the bread is often sunflower bread. 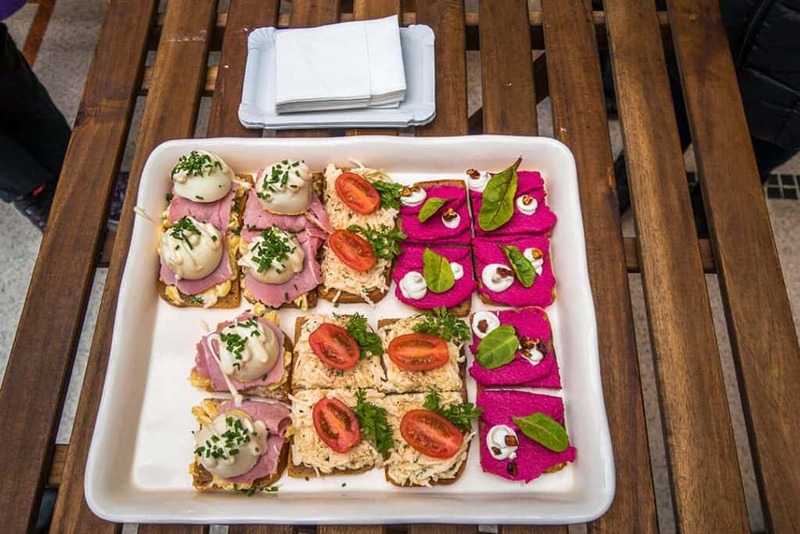 We tried Chlebicky with beetroot spread, goat cheese and walnuts, with a celery spread and tomatoes, and one with potatoes, Prague ham, egg and mayo. The ingredients are always very fresh and because it’s half hidden in an alleyway, only the locals (or the wise travelers) come here. If you are a vegetarian/vegan and were worried that you wouldn’t find anything to eat in Prague, Sisters Bistro is the place to go to! At Nase Maso Butchery they also make their own mustard… and delicious bacon sausages! Next to Sisters Bistro you will find the best and most famous butchery in Prague. Nase Maso (in English it’s: “Our Meat“) is a traditional butcher shop that sells quality meat from Czech farmers, using exclusively local ingredients. This is the place that is reviving the art of butchery in Prague: the owner only hired people who had never worked in this field before and who hadn’t studied butchery. Clean slate, as you might say. The reason is that he wanted them to learn only the old ways of cutting the meat. You can see inside the shop from the windows (check it out in our video on Youtube), so in case you are curious, you’ll see them working also on huge chunks of meat. There are two adjacent shops. One only sells hot dogs and sausages, while the other one sells raw meat and prepares delicious sandwiches and panini to go. Sausages are definitely to be considered traditional Czech food and are to be eaten while drinking a deliciously cold Prague beer. Now, even if Dany isn’t a drinker, she found the beer in Prague to be especially good. They have two versions, the blonde one is “stronger” (yet less strong than beer in Italy), and then they have a dark beer that is even lighter: the Praguers think that the dark version is the “beer for women“. We can assure you that they’re both very good but we preferred the blonde one! At Nase Maso Butchery we got to try the traditional Czech sausage, and a very good (but more fatty) alternative: in Prague they have bacon sausages, y’all! The Prague ham at this butchery is probably the best you’ll find in Praha, and guess what? There’s homemade mustard! Because the shops are tiny and very crowded (by the locals) at lunch, we suggest you to go get your sandwich or hot dog in the morning. Take it and save it for lunch, so you will be able to have a nice picnic somewhere or eat it by the Vltava River. If you are looking for an unusual Czech restaurant in Prague, Zvonice is perfect for you. Located in Nove Mesto, in a place that marked the beginning of the “new” part of Prague (as opposed to Old town Prague), you might not realize it’s there on first sight. It is in fact in the Old Bell Tower, on two floors (7h and 8th). You can easily say that this is the most romantic restaurant in Prague! Inside you will be able to dine next to the big bell, in an historical building that has only a few tables scattered here and there. It’s so tiny that the kitchen is above the dining area! 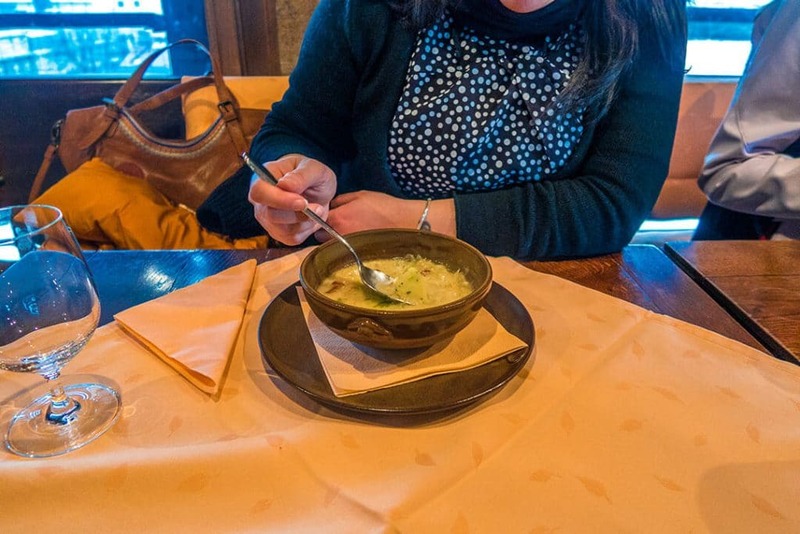 Here we had the chance to eat the best Old Bohemian sauerkraut soup in the world. To be honest the word “sauerkraut” scared Aldo to death, to the point that he didn’t want to taste his soup. Yet it was delicious! The soup was thick and filling, with wild mushrooms, sour cream and potatoes. Back in the day soups were the center point of Bohemian cuisine, and even today, albeit with a modern touch, are very much loved by the locals. Be aware that Restaurant Zvonice can’t be listed among the cheap places to eat in Prague, because it’s a bit more expensive than average. 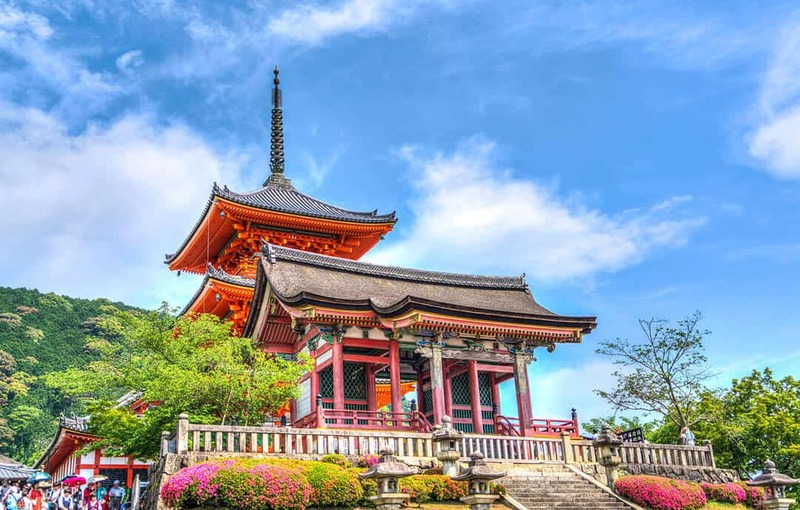 But if you are looking for a romantic place to celebrate something, or if you want to treat yourself to something unusual and classy, this is it! Have you ever dreamt of discovering a secret garden? You will find one in Praha. Styl & Interier is a haven of calm even in the peak season. This little garden cafè offers some of the best Czech food in Prague, and it’s hidden behind a home décor shop! To get inside you will actually have to go through the interior design showroom. Just like in some kind of secret club, you will be guided in a completely different area. The garden can be used both in Winter and in the warmer months. It was February when we visited and the air was particularly cold, so we were served mulled wine and hot apple juice to keep us warm. The funny thing is that on every chair or table there’s a price tag: just in case you want to bring home your garden table! They serve coffee, homemade soda, and had mouth-watering desserts. So beautiful that one of the girls in our group decided to order a cake for her birthday the following day! Styl & Interier has a seasonal and weekly menu: everything is homemade with their own recipes and fresh ingredients. The last stop on our Prague food tour brought us to the place where Robert invited his wife for a first date in Praha! Café Louvre isn’t just your Old Prague restaurant, but a famous hangout for Franz Kafka and Albert Einstein. It has in fact been in business since 1902 and has always belonged to the first rank of Prague’s cafés. They open at eight in the morning, which is particularly unusual in Prague, and it’s very popular among the locals… and the educated travelers. The Parisian Style of this café is particularly classy and romantic, but it never feels stiff. Here we ate Svíčková, a sirloin beef dish with a creamy sauce, dumplings and cranberries. The traditional dumplings in Prague aren’t what you’d expect. They are in fact slices of big loaves of boiled bread, moist and deliciously soft. The deal is that, just like a local, you have to dip the dumplings into the sauce and manage to finish both the sauce and the dumplings at the same time. Do you think it’s easy? Think again! Now in stead than just trdlo (which isn’t a local recipe), try a slice of the best dessert in Prague: Jablečný závin. What is it? But of course a deliciously warm apple strudel! Served with fresh whipped cream, powdered sugar and a side of caramel, it was absolutely divine. To the point that even while Aldo claimed to be full just a moment before the waiter brought us our plates, he polished his slice off in no time! 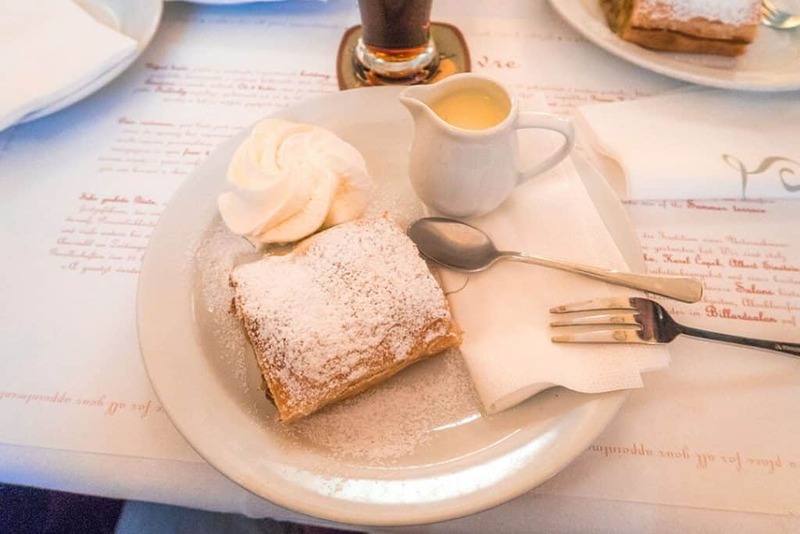 According to us, apple strudel is the true must eat food in Prague, the one that really represents the Capital of Bohemia. If you’re visiting Prague in the cold months, have a look at our packing list for Europe in Winter, with super-useful tips, cool outfit ideas and more! This post was written in collaboration with Eating Prague tours. Needless to say, our opinions are our own and aren’t necessarily the same as the Eating Prague tours Team. I really love the food in this region, especially the potatoes and soups. I just think there is something so lovely about how simple, filling and tasty it is, it seems like real home cooking from the heart. I think that the Czech cuisine offers a great variety, only not many people realize it! The best way to explore the true soul of a city is through its food!! 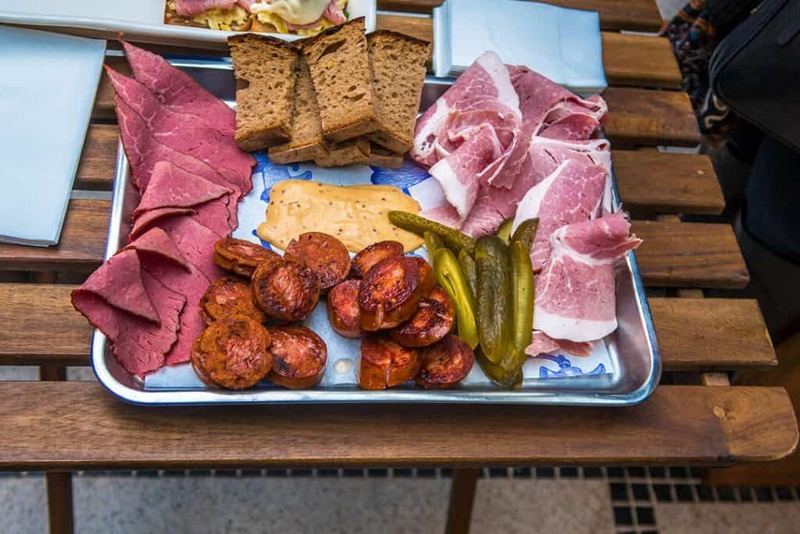 Great article detailing the best of Czech food in Prague. 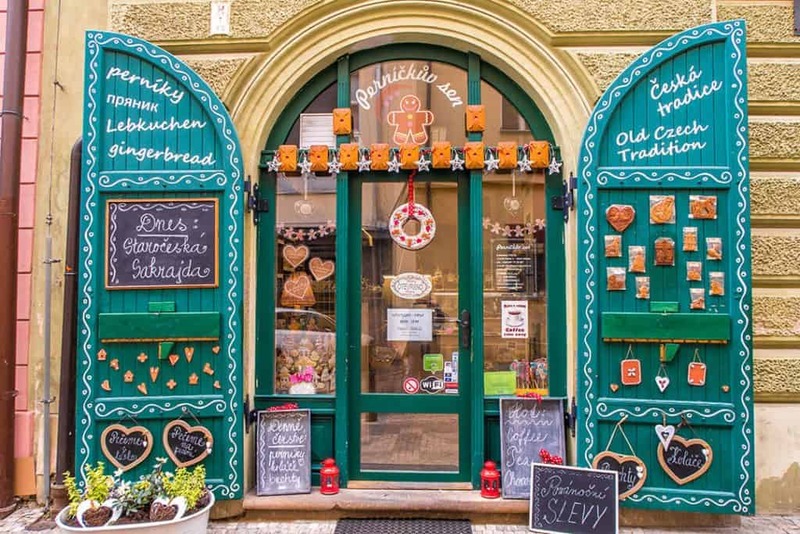 I’ve never been to Prague and don’t think I’ve ever sampled Czech food – but the Gingerbread house looks like the first port of call for my future visit! All those sweet treats look delicious! An Italian who didn’t have too much time in Prague, and decided to feed her wanderlust in stead than her stomach! 😀 And UGH I so can’t stand it when people are rude, assuming that tourists don’t understand them! Prague is such a beautiful city, I’m sure you’ll find it very much changed because it’s blooming right now. So many new buildings mix with the historical ones, there are shops and shopping centers and so many people are moving there from abroad! Also I had no idea their language sounds like Croatian! It’ so different from Italian, my mothertongue! We went for the same food tour while in Prague last October and it was such a fabulous experience. I’m remembering all the flavours and aromas as I type out this comment. Would gladly do it all over again! Was it also your first experience with them? I, too, love discovering a city by its local food. I’ve never taken a food tour such as this one, but you’ve convinced me it’s a good idea. I love Czech food, so this particular one would be high on my list. We found it pretty interesting because we got to explore the city with a local and learned a lot also about life in Prague. A good food tour is not only about the food but about learning about culture and traditions, so we think this one was spot on! I love Eating Europe’s tours! I’ve done them in London and Rome. They weren’t open yet when we were in Prague twice before, but if I return to Prague I’ll definitely do their tour there. I love learning all about the local food. Oooh I’m so curious now, what did you get in London? 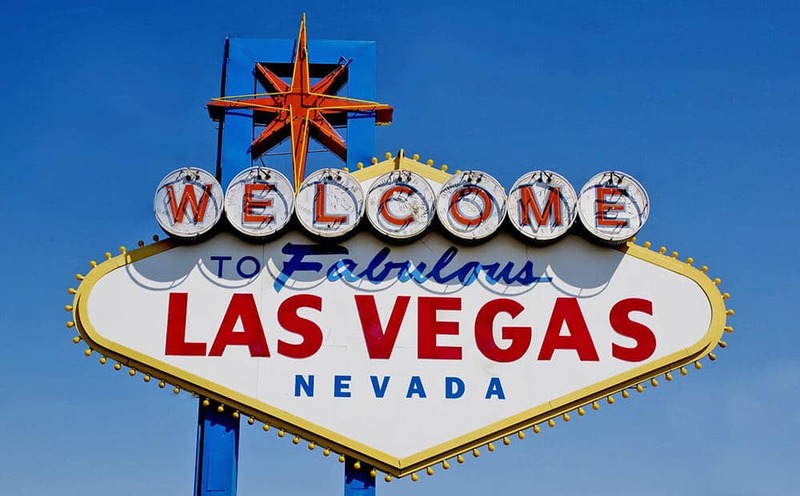 We just returned from there and I wish I’d known! I’ve just had dinner and yet I find myself hungry again… That’s a lovely account of the tour, and of some rather delicious-sounding dishes. I think I’d be there for the gingerbread, and the shop itself is so beautifully designed too. Oh yes the gingerbread man’s dream is so cute and definitely a must see in Prague! This is exactly the type of post I look for when looking for food tour suggestions. I love taking food tours and I love walking ones. This post is very detailed! Interesting that they prepare separate cuisine for tourists and locals. No surprise the tourist cuisine is more expensive. I wonder why they prepare two different kinds though! Thank you very much! 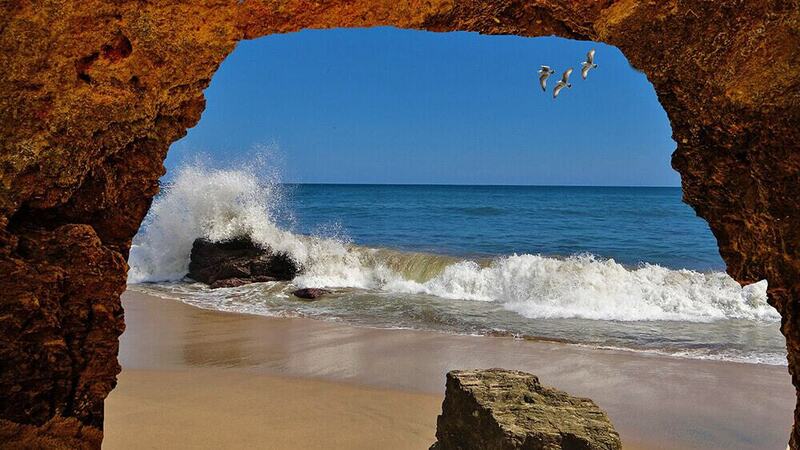 I hope it’ll be useful for your next trip! 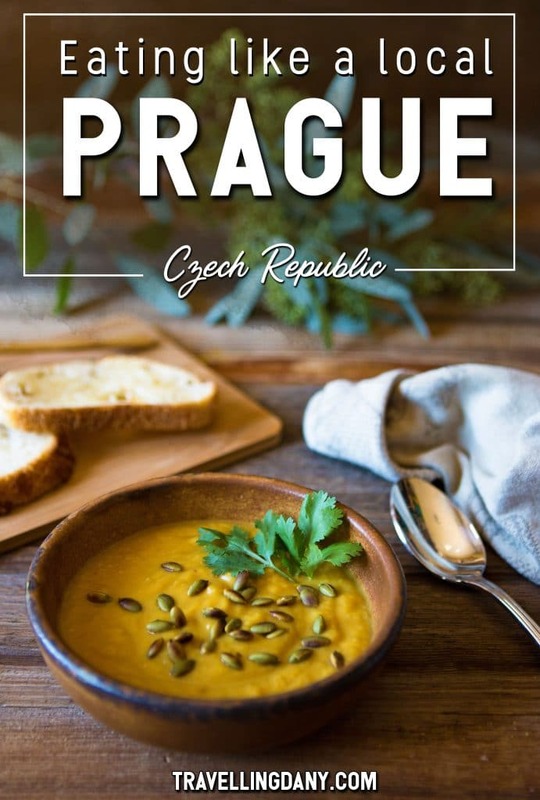 As for the tourist cuisine, it’s because tourists now expect to eat only stuff like trdlo or roasted pork, but the Czech cuisine is much more complex than that.. and surprisingly full of soups and vegetables, too! I wish I’d had this list two years ago, as although I ate pretty well I’d have loved to have tried some of these places! I 100% want to go to Pernickuv Sen to get the biscuits with plum jam, that is so a bit of me! I’m glad you recommended Eating Europe – I’ve done their tours in Italy and they are top notch and a great way of getting to know the local cuisine. My husband absolutely fell in love with the plum jam biscuits! I loved the butter and almond ones, so we bought a bag of both and we brought it back home! Yum! Actually it was our first food tour and I must admit that we were surprised at the quality. Our guide was so much fun, he knew a lot of information, facts, funny stories, and overall we spent the day enjoying ourselves, we couldn’t believe it was already time to get back to the hotel! 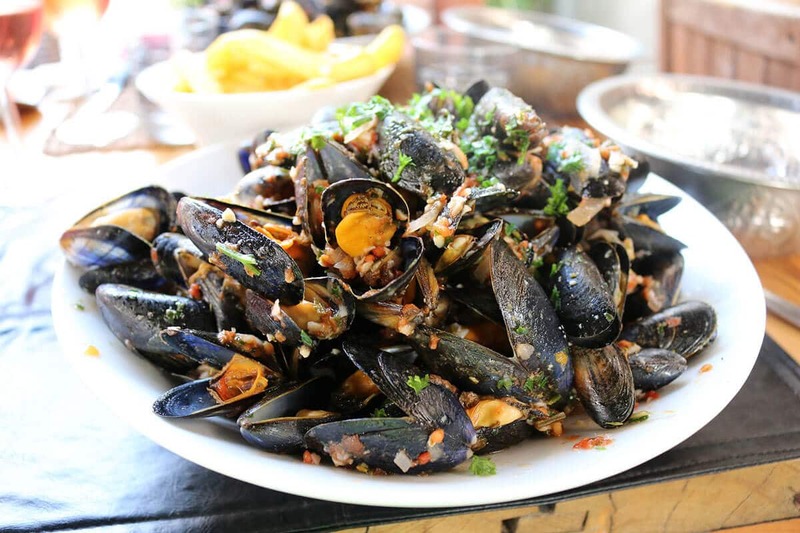 We can’t say enough good things about Eating Europe! Honestly we are not food tour fans. But I could so many benefits of taking it. Making new friends and learning the history are something really nice. The food too really looks nice esp the ginger bread and the shop which gives a look of Christmas time. We were the same way, we thought that it was a waste of time. But we soon realized that no one better than a local can tell you about facts, legends and stories tied to every recipe. Also buying where the locals buy is always the best way to go! I was in Prague a few weeks ago and took an evening food tour with Eating Europe, it was fab! I was actually surprised by the variety of the food in Prague, it is much more than meat & dumplings, and all delicious! I didn’t try that gingerbread though, I’ll have to go back and do that! Oh yes! I also thought it was all meat and dumplings, but then we realized there was so much more than that! Your food tour was slightly different than ours then? What did you eat? Really interesting post and gives a good idea about the history of a place by what they eat. I love trying out soups from around the places we travel as they always have local ingredients and recipes handed down over time. The beer in prague is amazing! Lucky you. I also loved the beer in Prague, and I generally am not a beer drinker! But it was fresh, light and very tasty! I’m literally drooling. What a delicious way to tour a city!! I love the idea of a food tours! I’m saving this post for whenever I make it to Prague, because I would love to do this! And eat one of those yummy gingerbread cookies. Oh this is very handy! When I went to Prague in the late 1990s, while I loved the architecture and friendly welcome, we found the food very limited and poor quality. It looks like a completely different experience now, and I’d definitely start with the Eat Prague tour for the introduction to the cuisine and to some great places, I have found that when the tour is a good one, it’s definitely worth the time! Thanks for taking us through each place, I love the sound of the gingerbread and the Czech sausage especially, but it all looks delicious. I think it’s all about where you eat: it has become very touristy and what you find in the main square or at the “restaurants for tourists” isn’t always what the Czech eat! Also… you spend way more money! 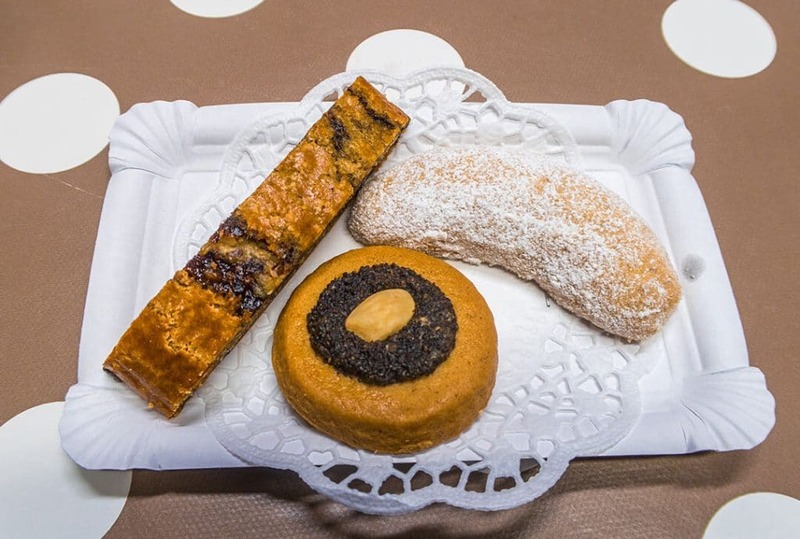 What a delicious roundup of Czech goodies. Everytime I go to Prague, I end up eating duck…because they prepare duck so well. But it looks like I need to try a whole bunch of other dishes next time I go! Apple strudel is at the top of the list. Do you get the roasted duck or another duck dish? Oh and Al just fell in love with his apple strudel. It’s nothing like the strudel we tried in other European countries! Last time I have tried trdlo and Kozel Beer in Prague. Now after reading your post and as a huge ginger lover, I need to try the ginger bread on my next visit to Prague. We’ve seen some the dishes and restaurants given our love for prague and are big fans of the apple strudel! My husband also loved the strudel! This really made my mouth water. I hardly tried any of the local dishes when I was in Prague! I’m going to have to get back there for sure and take this tour. I had no idea there were so many great dishes. I just can’t decide which I would like more between the sausages, pulled lamb, sauerkraut soup or apple strudel. I can’t wait to try them all. My friend is in Prague and I’m neon green with envy lol. I’ve already pinned for when I go and that gingerbread house is goalssss! Too pretty to even eat. Plus, apple strudel? Lord, I’m going hungry. You have one very lucky friend, we’ve loved Prague so much! Al has become addicted to apple strudel now!